Expecting the colonists of Omicron Ceti III to be dead after three years of exposure to deadly Berthold rays, Kirk and Spock are surprised to find the colony alive and flourishing. Spock beams to the surface and meets a young botanist, Leila Kalomi, that he'd worked with previously, and they renew the old friendship. When she worked with Spock six years before on Earth, Leila had tried to interest Spock romantically, and failed. 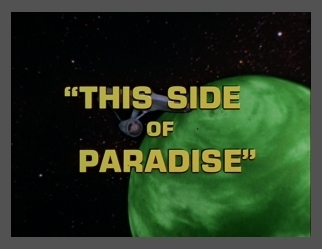 Now she leads the Vulcan to a secluded section of the planet where a native plant sprays him with their spores. Leila tells Spock that the plant induces feelings of harmony and peace and love, along with a desire to remain on Omicron Ceti III and their paradise. The spores serve to break down Spock's inhibitions and soon he has declared his love for Leila and his desire to remain on the planet. Some of the plants are beamed aboard the U.S.S. Enterprise and more of the crew are affected. Captain Kirk, the last holdout, finally is affected by the power of the spores and discovers, through his own violent, adverse effect at leaving his beloved U.S.S. Enterprise, that strong, violent emotions are what reverse the effect of the spores. Kirk manages to lure Spock back to the U.S.S. Enterprise where he goads Spock into a fight. The extra adrenaline in the Vulcan's system pushes the effect of the spores from Spock and he reverts to normal ... just short of killing Captain Kirk. Using subsonic sound waves, the two officers manage to bring around the rest of the crew and colonists. Now that the colonists realize that the spores have prevented them from making any real progress and accomplishments, they plan to relocate where the plants do not grow. Nobody does, Mr. Spock, nobody does. Jill Ireland played the role of Leila Kalomi. She was a very beautiful woman. Sadly, she died of breast cancer in 1990. Trivia: She was married to Charles Bronson. Sandoval is a bit of an annoying chap, don't you think? dragon would make for a good story. Can't really blame Mr. Leslie. He's under the influence of the Spores!! Would you like to hear a blooper of this scene? Oops! Slip of the tongue!! Just do an internal scan of the ship. Uh oh! Now the insults are flying!! Look out Kirk, Spock is MAD now!! really get to him. I know she would me. story of how Spock and Leila met. It's too bad they never told us what Spock's name is. McCoy gives a rare glimps of his tough side! regrets leaving and maybe he does on a certain level. I wonder if Spock kept in touch with Leila. I'd like to think he did. Yes, I know it's only a TV show.